For a couple of years, the boutique luxury cruise company Windstar and I have been looking for fun ways to work together. From the outside looking in, their cruises and ships seemed like a perfect match for my experiential luxury style of travel and it really came down to finding a place and a time to try them out. That opportunity finally arose recently in French Polynesia, a destination I’ve long wanted to visit. I’m a fan of small ship cruising so I was pretty sure I’d enjoy the experience before I even left home, but it wasn’t until after I spent a week with them onboard the Wind Spirit that I knew for sure it was a great match for my preferred style of travel. 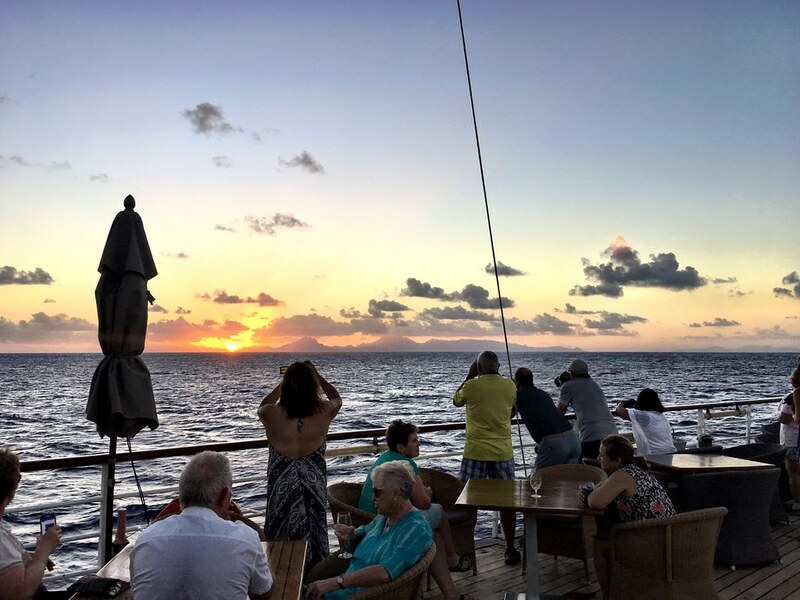 In this post I want to share my own personal experience of what sailing with Windstar Cruises is really like, both the positives as well as a few constructive criticisms on how they can continue to improve what is ultimately a wonderful cruise experience. What Does Boutique Luxury Mean? Boutique is an oft-used phrase, but what we mean by it is that the travel experience is smaller and features specialized services for the guests. It can be luxury, but not always, and it can be adventurous, but not only. Boutique travel in my experience though is offering something unique, something different in a way that is comfortable, stylish and forward thinking. Windstar Cruises lauds itself as a boutique cruise line and from my own experience, that’s definitely true. I sailed on the Wind Spirit, a 4-masted yacht that, at maximum occupancy, can accommodate 148 passengers. On my sailing there were 125, which, by cruising standards, is a very small group. The experience actually reminded me more of expedition-style cruising I’ve done in the Galapagos and Antarctica rather than other small-ship cruises I’ve enjoyed. It’s not just in the number of guests, but in the overall feel of the trip. The guests were there to be spoiled, sure, but also to experience a new destination. They were excited and eager to get out there and get their hands dirty all in the name of adventure. Onboard, the crew went to great lengths not only to enable this adventurous spirit, but to also provide an incredibly comfortable home for passengers to return to. It was intimate, personalized and fun and that, more than anything else, is what boutique travel should be. Windstar features itineraries around the world, but I can only speak to their Tahiti offerings. Any good cruise line will keep the ports of call, the destinations themselves, front and center and during my Windstar experience, that was certainly the case. It’s hard not to instantly fall under the allure of French Polynesia as soon as you step onboard the ship, docked in the capital city Papeete, guests will already have had some time exploring paradise on their own. Frankly, I think it’s probably hard not to enjoy spending time in French Polynesia. It’s one of the most beautiful regions in the world, and experiencing it from a cruise ship was the perfect first introduction. I was able to visit several islands, learn more about them and ultimately figure out which ones I liked the best for future trips. The Windstar cruise allows unique access to these amazing destinations in a way that is both luxurious and fun. I sailed the Windstar Cruises “Dreams of Tahiti” itinerary, seven days visiting Papeete, Moorea, Tahaa, Raiatea, Bora Bora and Huahine. Since each port of call was very different from one another, how I chose to spend my time also varied greatly. I spent a lot of time talking with other passengers and learned that they decided to experience the islands in the same way I did, in a mix of planned and unplanned adventures. At each stop, Windstar offers a wide variety of excursions running the gamut of interest and physical abilities from simple sightseeing tours to more adventurous adventure experiences and plenty of chances to snorkel or dive. Getting around independently was also easy though, and combining the two styles of travel was the perfect way for me to experience the islands. Windstar also includes several special extras at no additional cost, experiences that add to the overall enjoyment of the cruise experience. The first time I experienced this was while on Tahaa and a private island or motu that was available to guests throughout the day. Frequent tenders shuttled passengers over to the nearby island for a day of relaxing in the sun, swimming, snorkeling and beach sports. The entire culinary team set up shop on the island and organized a huge lunch for everyone to enjoy. It was a highlight of the trip for many of us, although at the time we didn’t realize that Windstar would improve even on this amazing experience near the end of the cruise. Near the end of the trip, passengers had access to yet another private motu, a special island with towering palm trees and amazing views of the water and nearby islands. Once again, the culinary team created a wonderful dining experience under the stars, with local dancers and singers entertaining the group. Midway through the dinner I looked around and couldn’t find anyone without a smile on their face. It was the perfect way to end a perfect cruise, a Polynesian experience no one will soon forget. When selecting a cruise, the ship itself and the living spaces are important and for the most part, I was pleased with what I found onboard the Wind Spirit. The Wind Spirit is not your standard cruise ship. Part yacht and part cruise ship, its defining feature are the 4 sailing masts that tower above the top deck. The smaller size, the sails and the warm hospitality onboard make it all come together to make it feel as if you’re on your own private yacht. It is a small ship though, at its maximum the Wind Spirit will accommodate a very reasonable 148 guests. In spite of this low number, I was surprised at how many public spaces there were; any number of opportunities to relax and decompress. Wide-open, teak decks have a classic feel and the pool deck with a small plunge pool and hot tub quickly became the most popular spot on the ship. In addition to the ample open-air deck spaces both bow and stern, there’s a large lounge, library, spa and oddly enough a small casino. Most of these public spaces made sense, although to be honest it’s bordering on the need for a design refresh. The finishings aren’t out of date yet, but they’re getting there fast. I also didn’t love the fact that there was a casino on a ship of just 148 guests. It seems to me that the space could be better used, but overall it wasn’t a big deal and in no way dampened my own cruise experience. There are also a few extra spaces onboard that I wasn’t expecting, namely the gym and Watersports platform. A constant theme throughout my experience on the Wind Spirit was how often I found extras and amenities normal for a large ship, but an unexpected surprise on a smaller ship. I like to work out when I travel, if possible, and being able to get some time in on the elliptical was a great way for me to burn off some of those calories from the amazing meals onboard the ship. The real star of the extras though is the Watersports platform. When possible, while the ship is anchored the back opens up and a watersports platform comes to life. From there you can just swim or use a variety of equipment including snorkel equipment, floating sunbathing pads, kayaks and even small dinghies and water skiing. I used it more than once and had a great time doing my own thing on my own time. The Wind Spirit is a little different in that every single room is essentially the same with one exception, the Owner’s Suite. So unless you’re in that room, then you really don’t have any decisions to make when it comes time to select a place to sleep. Walking into my own stateroom I was pleased immediately with both the size of the space as well as the crisp design. Just a quick note; while I think the design looks great at the moment, I do think it’ll be necessary for Windstar to refresh the rooms in the next few years. Just like the public spaces, nothing is out of date yet – but it’s close. Each room features ocean views, queen beds, flat-screen TV and Bose SoundDock so you can listen to your own music. There’s also a small sitting area, which I found very useful as well as a compact but well designed bathroom. Overall, I enjoyed the stateroom and found myself relaxing there fairly often, a testament to the quality of the product and how comfortable a space it really is. One perk I noticed consistently was just how much care was put into the overall shipboard experience even though the passenger complement was so low. The crew went to great lengths to ensure everyone had a trip they’d never forget and I really appreciated that. Just as on other cruises, all meals are included with Windstar including 24-hour room service from breakfast foods to small bites. There are two main dining venues onboard the Wind Spirit, AmphorA restaurant features high-end, multi-course dinners and the Veranda restaurant is a more casual buffet style eatery open for breakfast and lunch. They also have a special dining event known as Candles allowing guests the opportunity to eat under the stars on the top deck, an experience Windstar tries to ensure every passenger gets to enjoy at least once during their cruise. Overall, I was very pleased with the food options. Breakfast and lunch both had plenty of choices available either on the main buffet or made to order. It’s a nice mix of prepared and made to order food offerings and ensures that everyone gets something that they enjoy. Dinners at AmphorA quickly became a personal favorite however, thanks not only to the wonderful service but also to the high quality of the food offerings. The menus changed nightly, with a standard list of classics always on offer, and not once was I disappointed with my dining experience. In fact, my major problem was that I couldn’t eat more. Onboard Windstar, soft drinks, juices, tea and coffee are always complimentary, but alcoholic beverages, from wine and beer to hard liquor was available for purchase only. Honestly, I found it a little odd that they didn’t offer passengers complimentary beer and wine during meals, especially since the cruise line lauds itself as a luxury product. A major pet peeve of mine when I cruise is being made to feel as if I’m being nickel and dimed. I do not like signing my name multiple times during a cruise, it’s just a matter of personal preference. If I were Windstar I’d rethink their beverage policy a bit if they want to continue to compete with the other small ship luxury lines currently sailing the seven seas. At the end of the day though, it really wasn’t a big deal and I only heard a few complaints about it from other guests. I’ve already alluded to it, but the service and hospitality onboard was beyond reproach. Since it’s a small ship, the crewmembers all wear many hats but they do so with ease and professionalism. Whether it was the waiter at dinner remembering my favorites, or the activities director going out of her way to help me make some special arrangements, the crew truly made the overall experience something extraordinary. That level of commitment is key in creating a true boutique experience and it’s something that has to be ingrained into the shipboard culture. It can’t be faked or simulated, and it was a wonderful perk to experience throughout the voyage. My own experience onboard the Wind Spirit on a Tahiti cruise could not have been better. I was already a big fan of small ship cruising, and this was one of the smallest ships I’ve ever sailed on. It was a curious mix of leisure and expedition style cruising, all the while maintaining high standards and incredible comforts. Every night when the ship sails out of port, there’s a special ritual that’s played out on the top deck. The massive sails are unfurled, majestic music plays across the speakers and everyone toasts the moment as the sun joins in with a spectacular sunset. It’s a special moment, a bonding experience and one that I think perfectly encapsulates the Windstar Cruises experience. It’s dignified but fun, adventurous but comforting and it’s that combination of attributes that transforms an ordinary travel experience into something that one remembers for the rest of their life.